It's hard to believe Ultimate Spider-Man is nearing the buck-and-a-quarter mark. Perhaps even more mystifying is that it's not only still carrying on, but doing so with renewed vigor. The last six months of USM have been among the best in the book's lifespan, and have served as an excellent launch pad for new penciler Stuart Immonen's run with the character. Part of what I've loved about these recent issues is their renewed interest in the characters behind the masks. 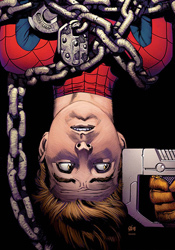 For a while, the series had shifted its focus more towards outrageous adventures and interactions with just about every hero and/or villain who caught writer Brian Michael Bendis's fancy. He'd lost sight of Peter's civilian identity, a big part of what made the story connect in the first place, and it didn't look like he'd be going back. For a time, I seriously considered dropping the book. Now, I'm glad I didn't make that mistake – this issue is just the latest installment in USM's about-face, its return to what made it so great at its outset. Bendis has such a firm understanding of these characters that it's hard to imagine anyone else ever taking over. Under another writer's watch, the carefree moments between Pete and his buddies that are scattered throughout each issue would feel dangerously cheesy and happy-go-lucky. With Bendis in charge, they're my favorite parts of the story. His cast is comprised almost entirely of high schoolers, and they speak and act as such. What's more, they've all shown tremendous growth as individuals from the first issue up to today. Ultimate Spider-Man's cast is among the deepest in any current mainstream book, and Bendis knows precisely when to bring back an old face and cycle out a character ready for a break. This month, for instance, he's brought perennial punching bag The Shocker out of retirement to teach Peter a lesson about complacency, and the message is loud and clear. After a hundred twenty five issues, Parker may have a firm grasp of his powers and his spot in the pecking order, but he should never take anyone lightly. Bendis is still at the top of his game, and it doesn't look like he'll be coming down any time soon. And I could say exactly the same thing about Stuart Immonen. It's a real rarity when two top-level talents come together on the same book and actually serve to push each other to new heights, (if anything, the pressure seems to bring the worst out of those kind of collaborations) but that's clearly becoming the case here. Immonen is absolutely on fire in this issue, whether he's working with Peter teasing MJ on the streets of New York or the Shocker pummeling a chained-up Spider man in a dark, gritty industrial warehouse. This is gorgeous work, providing detail where necessary while retaining a clean, stylized overall appearance. Stuart gives each character their own face, and has no problem painting them with appropriate emotions without distorting their identity. He may be one of my favorite artists working today, and issue 122 is some of the best work he's put out to date. Some of USM's best stories have been self-contained, and this is yet another shining example. It goes in a rich, unexpected direction, grants the reader valuable insight into a handful of central characters, and leaves a big impression. What more can I say? If you aren't reading this yet, you should correct that oversight immediately. Buy it and enjoy the greatness of this run while it lasts.